Although technology is a major part of a students school day, students spend anywhere from 36% to 66% of their kindergarten day performing fine motor tasks, and 42% of their school day performing handwriting or pencil to paper tasks (Marr, Cermak, Cohn & Henderson, 2003). A child is more likely to integrate knowledge through the use of multiple senses. This is also true for handwriting ability. This is due to the fact that many of our senses are needed in order to complete the tasks related to proper handwriting such as grasping/manipulating a writing utensil, using correct letter formation and letter size, writing within the boundary of a line, and spacing between letters and words. For example, the Proprioception/Kinesthesia senses are responsible for having children write within boundaries and understanding directionality/spatial awareness. If children do not have a well developed sense of space within themselves they will have difficulty relating it to a more abstract concept such as handwriting (Cornhill, Case-Smith,1996). Previous studies have shown correlations between visual motor integration and handwriting performance and handwriting legibility (Weil & Amundson, 1994). The study was conducted over the course an eight-month period within a preschool setting with two preschool classes. Nine students in the experimental group (morning class) received the Paw Prints curriculum, and seven students in the control group (afternoon class) received handwriting instruction based on the teacher’s preference. Both classes had the same teacher. The groups were tested at the beginning of the school year with the Beery VMI, and were re-evaluated eight months later. This test was chosen due to its correlation between a child’s ability to copy geometric forms and academic achievement. The Beery VMI scores of the children in both classes showed improvement. However, when analyzed using the Levene’s Test for Equality of Variances. There was a statistically significant improvement in the scores of the Beery VMI of the experimental group when compared to the scores of those in the control group (p= .002). The students in the experimental group improved their percentile rank by an average of 35%, while the students in the control group improved their percentile rank by an average of 8%. It has been suggested that there is a strong positive relationship between a student’s performance on the Beery VMI and their ability to copy letter’s legibly (Daly, Kelley, & Krauss, 2003). This is due to the fact that the lines and curves that makeup geometric shapes are also used to form letters. 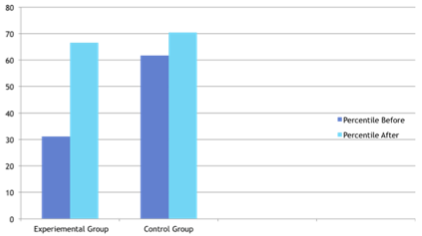 Based on these findings as well as our results, it was suggested that the students in the experimental group showed greater improvement in their ability to draw the lines and curves needed to create letters than those in the control group. The Beery VMI scores of the students in both classes showed improvement during the course of the eight month study. Children’s skills will improve regardless of curriculum due to the natural development of the child as they age, as well as improvement from receiving some type of instruction. However, there was a statistically significant improvement in the scores of the Beery VMI of the students who had the benefit of being taught with Paw Prints when compared to the scores of those who did not.